Coppell junior pinch runner Dylan Nichols leads off from third during the first inning of Tuesday’s game at the Coppell Baseball/Softball Complex. The Cowboys defeated the W.T. Longhorns, 13-3. 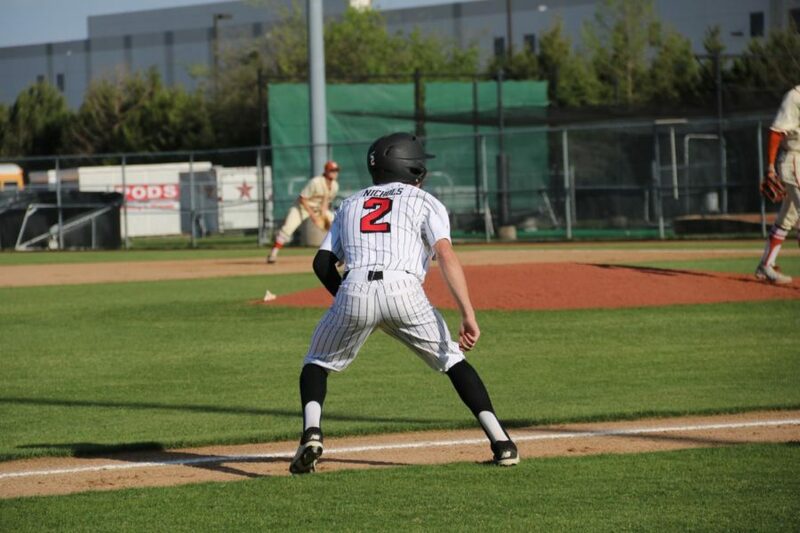 On Tuesday evening, the Coppell baseball team run ruled W.T. White, 13-3, with a single in the bottom of the sixth inning hit between third and short by senior pinch hitter Andres Morales scored senior designated hitter Reid Valentine. The two-game district series concludes at 5 p.m. Friday at W.T. White. 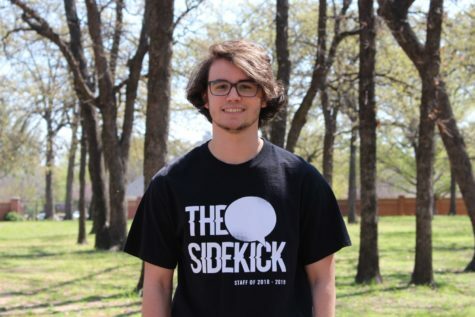 The score was 12-3 after junior second baseman Porter Hardcastle singled to left center, and in the process, knocked in senior shortstop Adrian Minjares, who had led off the inning. Back at the top of the order, Morales came in to pinch hit for senior right fielder Anthony Villalobos. Coppell ended the game with nine hits and four walks. Each Coppell hitter made it on base at least once and were even able to hit through the order completely in the third. Coppell senior right hander Rye Gunter started the game and pitched from the first to the fourth inning. He was relieved in the fifth by junior pitcher Dylan Nichols. In total, Gunter threw 73 pitches. The third inning was the only time in the game in which the Longhorns scored, although Gunter gave up only two hits during the inning. Two hits, two walks and an error got the Longhorns three runs, where they would remain for the rest of the game. During the bottom of the third, the Cowboys had a five-run rally led off by Minjares after hitting a solid double to right center field. Valentine and junior left fielder De Heath followed by both getting to first on errors. Hardcastle kept the rally alive by laying down a bunt on the third base line, which loaded the bases and brought up the top of the order. Villalobos walked, scoring Valentine and advancing each runner. Junior first baseman Nick Vernars was able to clear the bases on a high pop up and error into the deep, right field corner. Junior third baseman Kalen Clark came up in the order after Vernars but was unable to get on base, leaving Vernars stranded at second. Coppell went quietly in the fourth but was able to score one run in the fifth. The final three runs in the sixth put the Cowboys 10 runs ahead, ending the game due to the mercy rule. This win against W.T. White marks Coppell’s 19th overall victory this season and their seventh district win.